Josh Cote is the son of a watercolorist who grew up surrounded by art and artists. He spent his youth painting with his father and traveling with his family to art fairs up and down the east coast. 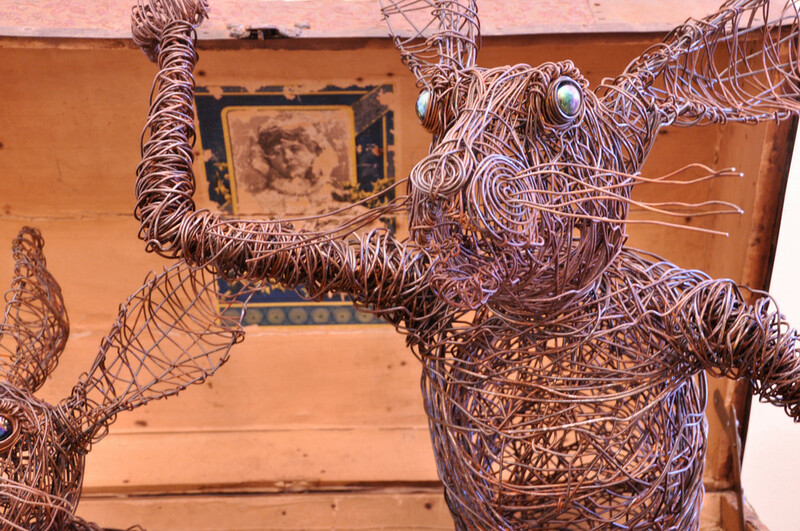 After studying painting and drawing at The University of Michigan School of Art, Cote became a self-taught sculptor who utilizes hand-modeled resin, cold-worked wire, found objects, glass, welded steel, and negative space to create unique and fanciful sculptures of ravens, porcupines, monkeys, rabbits, and many other creatures both wild and mythical. With only needle-nosed pliers, innovative techniques developed by the artist are applied as the wire is painstakingly hand-manipulated, wrapped and woven to itself. Using negative space, combined with the linear nature of the wire, the finished work is much like a pen and ink drawing in sculptural form. Similar to a gesture drawing, yet as a free standing sculpture, the manipulated wire captures the energy and life of the subject, there is movement and mystery. Wire sculpture is a bare and honest medium as nothing is hidden, all is revealed to the beholder. Usually the raw metal wire is left in its natural achromatic state, but sometimes the wire is oxidized with a variety of acids to achieve unusual patinas. Every sculpture is unique and inimitable, impossible to replicate. “My sculpture attempts to explore the boundaries and relationships between man, woman and nature, centered on our relationship to the environment,” says Cote. “Fusing elements of folk art, surrealism and realism, ideas arise from dreams, observation and nature. I often work with themes of transformation, nurturing and regeneration. My creative energy is about growth and perceiving this energy with intuition. The challenge, the art, is attempting to translate this mystery through the process of my sculpture.